Cast of the celebrated statue of the Apollo Belvedere in the Vatican, plaster. You are here: CollectionsOnline / Cast of the celebrated statue of the Apollo Belvedere in the Vatican, plaster. The original white marble statue from which this is a cast is thought to be a Roman copy (made in the second century during the Hadrianic period, c.120-140 AD) of a lost bronze original made between 350 and 325 BC by the Greek sculptor Leochares and depicts Apollo as a standing archer, just having fired an arrow. The statue was rediscovered during the Renaissance, probably in 1489 in the Anzio region of Italy and was in the private collection of Giuliano della Rovere before he became Pope Julius II, displayed in his garden. He moved it to the Vatican where today it is in the Gabinetto delle Maschere of the Pio-Clementine Museum. The statue was restored in the 1530s when the left hand, right forearm, and fig leaf were added at the request of Pope Paul IV. Soane's cast records these additions in place. After World War II the Renaissance additions were removed from the original statue in the Vatican, with the exception of the fig leaf but this too has now been removed (late twentieth century). The Apollo Belvedere was regarded from the mid-18th century as the greatest sculpture of antiquity and the epitome of male beauty. Its complex contrapposto stance showing the figure both frontally and in profile was particularly admired. It was praised by the celebrated German art historian Winckelmann in the mid-18th century for its 'noble simplicity and quiet grandeur' and also by Goethe, Schiller and Byron. 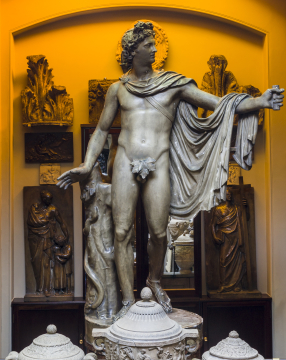 Soane saw the statue on his Grand Tour in the late 1770s. After Napoleon seized it and brought it to Paris following his Italian campaign it was on display in the Louvre from 1798, where Soane saw it on his visit to Paris in 1814. In 1815 following the defeat of Napoleon the statue was repatriated to Italy. This full-size cast is described in the earliest Museum inventories of 1837 as ‘A Cast from the Antique Statue of the Apollo Belvedere, brought into England by the Earl of Burlington and formerly in his Villa at Chiswick’. Richard Boyle, 3rd Earl of Burlington presumably had the cast made in c.1819 in Rome from the original in the Museo Pio-Clementino in the Vatican. The cast was later given to the architect John White (1747-1813) by the fifth Duke of Devonshire, for whom White added wings to Chiswick House in 1788. White subsequently presented it to Soane, as the latter records in the 1830 Description of his house (p.3): ... Cast of the Apollo Belvidere [sic], taken from the antique statue itself, brought to England by the late Earl of Burlington, by whom it was placed in his celebrated Villa at Chiswick. It was subsequently given to the late Mr. John White, who presented it to me. The Apollo was moved to Soane's house in Lincoln’s Inn Fields in 1811, probably from White’s house in Devonshire Place, St. Mary-le-bone, and the bill for this survives in the Soane Archive, showing that at least seven men were employed on the job and that £1.4s was paid to a Mr Mathews ‘for canisters’ – probably basket work protection – to help in the move. The total cost was £16.17s.6½d. Soane wrote in his 1835 edition of the Description that he had ‘set so much value on it as to take down a large portion of the external wall in order to admit it into its present position’ (e.g. that he made an opening in the back wall onto Whetstone Park, the mews behind the house, to bring it in). 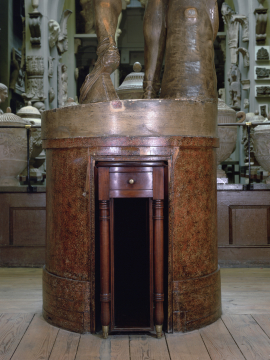 Soane also designed the current pedestal of wood and plaster, painted in imitation of a red marble and incorporating a small table in the back (Museum number XF179). Since 1889-90 there has been an arched opening behind Apollo (as in the image with this entry) but at the time of Soane's death this was a solid wall and Apollo stood against a backdrop of bookcases. The small table therefore could be pulled out to transform the small area behind him into a mini-library. The cast seems to have come with a circular marble base with the appropriate symbols of a lyre and a snake in relief – which Soane used as the base of his pasticcio - a column of architectural fragments in our central courtyard, from 1819 and before that as the base for a different internal arrangement in the Dome Area in the Museum (recorded in a number of drawings). The 1830 Description of the column (p. 7) reads ‘This Pasticcio is composed of the pedestal upon which the Cast of the Belvidere Apollo, now in the Museum, was charged ....'. He does not explicitly state that the Apollo was on this base at Chiswick but Soane certainly didn’t have it made since the base and the statue seem to have been always separated from each other once the statue arrived in Soane’s house (early views of the cast in the Museum dating from 1811, the year it arrived, do not show it on the base). As the figure is a plaster cast it is most unlikely to have stood outdoors at Chiswick House. Sadly it has not so far been possible to identify where it was displayed there. Made for Richard Boyle, 3rd Earl of Burlington, in Rome. Presented to Soane in 1811 by the architect John White junior. In the 1835 Description of his house Soane recalled its acquisition saying that it was 'moulded from the original statue for the Earl of Burlington, and placed in his celebrated villa at Chiswick. When the alterations were made by my esteemed friend Mr White in that Palladian edifice, this statue was given by the Duke of Devonshire to that gentleman, who presented it to me for its future safe custody: and I set so much value upon it, as to take down a large portion of the external wall in order to admit it into its present position'.